October is one of the most variable months for the Great Lakes region of the United States. Temperatures can range anywhere from highs in the 80s to cold enough for snow. So turn on a fan or turn up the heat and consider the changes October brings to foliage and blooms, the tasks and decorating at hand, and the beauty of this most colorful month. Witness fall color. While the autumn color often continues into November, the big show comes in October, as shown with this sumac (Rhus copallina). Foliage’s dramatic color change is the result of cool nights and sunny days. Unfortunately, the autumn colors might not be as vibrant this year due to drought. Great fall color can be found lower to the ground. 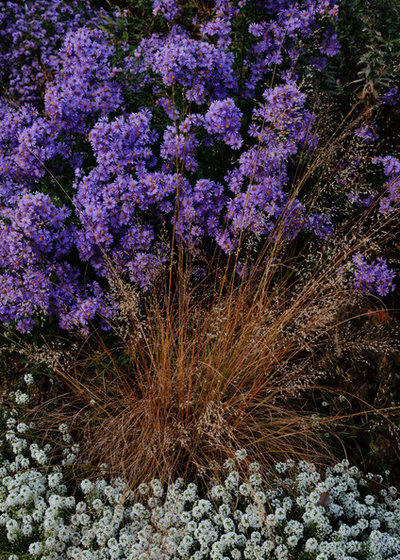 Native prairie grasses reach their peak in shades of red, yellow, purple or orange in October. Prairie dropseed (Sporobolus heterolepis) sets off the native smooth aster (Symphyotrichum laeve ‘Bluebird’) here, with the annual sweet alyssum (Lobularia maritima) at their feet. 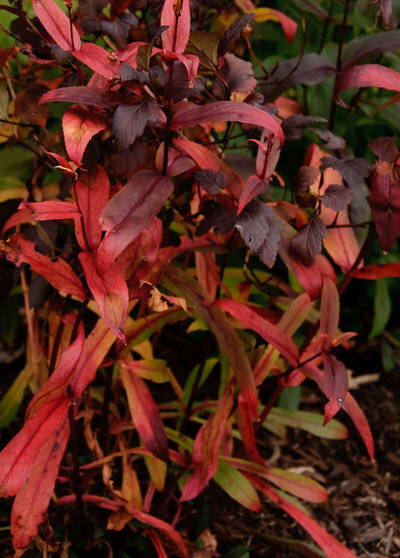 The foliage of many perennials, such as Penstemon ‘Dark Towers’ (shown), hosta, perennial geranium species and echinacea, provides a blaze of autumn color. Appreciate frost-tolerant blooms. 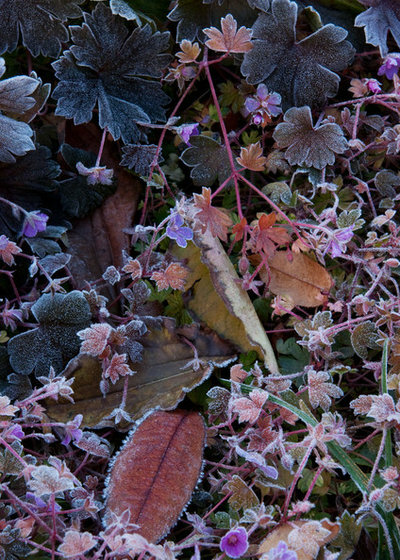 The first hard frost usually happens sometime in October in Great Lakes gardens. Many flowers tolerate frost (as opposed to a freeze) quite well, including this little cranesbill (Geranium ‘Bob’s Blunder’). Frost-tolerant annuals include snapdragons (Antirrhinum majus), Diascia and petunia. 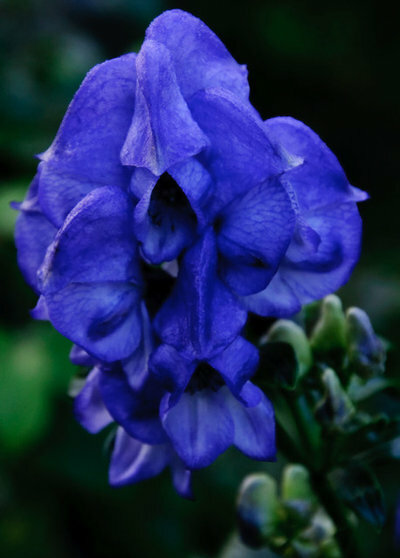 … such as the deadly but beautiful monkshood (here, Aconitum carmichaelii), often reaching 6 feet in height. And there’s also the equally tall yet more benign Siberian aster (Aster tataricus). It wouldn’t be autumn without mums. Instead of planting florists’ mums every year, plant Korean mums, such as Chrysanthemum x rubellum ‘Sheffield Pink’, which are hardy and live for years. Depending on the weather, they can bloom even into December. Extend garden color. In addition to blooms, October sees the ripening of berries and seed heads. 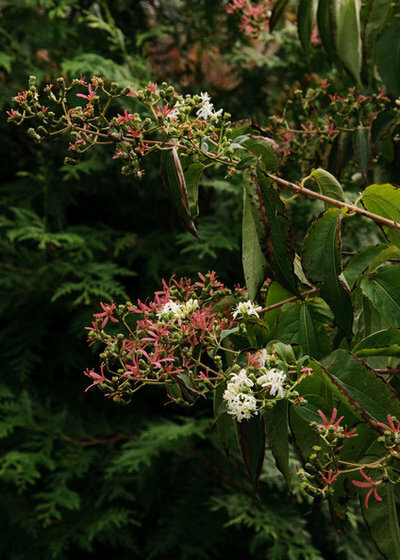 Here, the reddish bracts of seven son’s flower (Heptacodium miconioides) extend the show as the blooms fade. The dark red seed heads of Physocarpus opulifolius ‘Monlo’ (Diablo) set off the bright red of the turning leaves (Symphyotrichum oblongifolium ‘October Skies’, in foreground). Rose hips, crab apples and the fruits of Viburnum species offer bright color until they are consumed by wildlife. 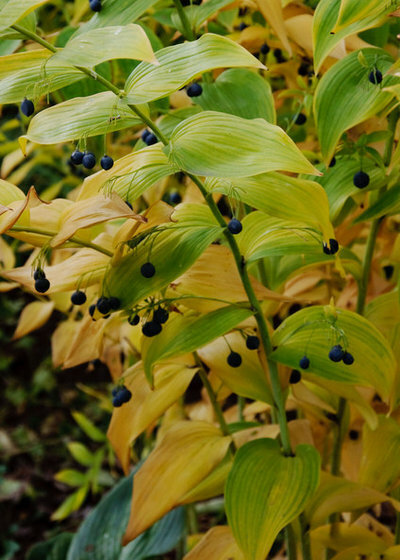 The native Solomon’s seal (shown here, Polygonatum commutatum) offers both colorful berries and fall foliage, as does the red-berried Solomon’s plume (Maianthemum racemosum). Manage pests. 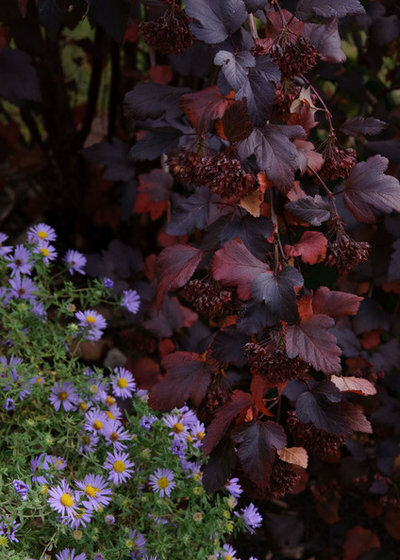 The beauty of October gardens can distract gardeners from important tasks that need to be tackled now. Potato beetles are destructive bugs that damage the blooms of asters, mums and roses. Daily hand picking while deadheading helps minimize the damage. Plant and divide for spring. • October is the perfect time to divide spring-blooming wildflowers and ephemerals. Jack-in-the-pulpit (Arisaema triphyllum) benefits from division and immediate replanting. • Plant spring-blooming bulbs as well. Put some in containers for forcing to enjoy early blooms indoors. Set the pots in a cool, dark place and water the bulbs weekly. • Collect fallen leaves from the lawn, then shred them and make a leaf-mold pile for use next summer. • Dig up dahlias and other tender bulbs for storage after frost blackens the foliage. Move perennials grown as part of container plantings into the ground now to allow them to get established before winter. • Bring in tender perennials before a hard frost strikes. Decorate for the holidays. October provides a plethora of plant material for harvest and Halloween decorating. Pumpkins are great to use in containers and in the garden to fill empty spaces left by tender plants. Be sure to spray them and Indian corn with deer and squirrel repellant to keep them from becoming an all-you-can-eat buffet for wildlife. Grapevine wreaths decorated with berries and seed heads provide a welcoming front door touch. Jack-o’-lanterns and Halloween decorations on the front porch add a finishing touch. Enjoy seasonal change. Keep your eyes and ears open for the migration of butterflies and birds, but don’t spend all your time working in the yard. Make sure you get out and enjoy nature’s finery before it’s all gone.